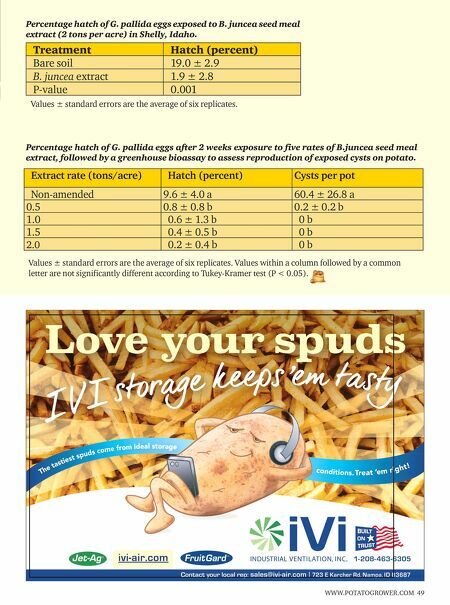 WWW.POTATOGROWER.COM 49 2354-29IndustrialVentilation12h.indd 1 1/2/19 9:46 AM Treatment Hatch (percent) Bare soil 19.0 ± 2.9 B. juncea extract 1.9 ± 2.8 P-value 0.001 Values ± standard errors are the average of six replicates. Percentage hatch of G. pallida eggs exposed to B. juncea seed meal extract (2 tons per acre) in Shelly, Idaho. 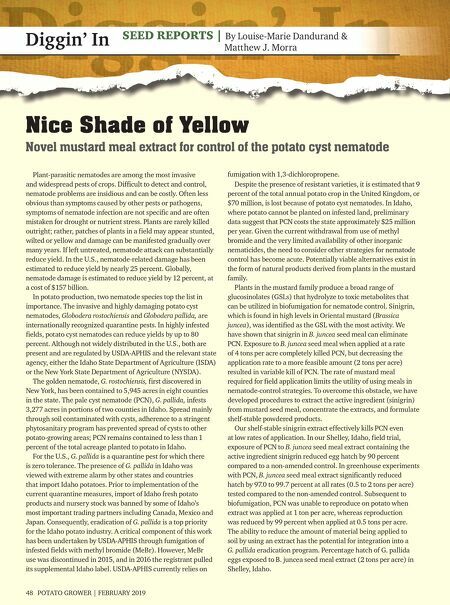 Extract rate (tons/acre) Hatch (percent) Cysts per pot Non-amended 9.6 ± 4.0 a 60.4 ± 26.8 a 0.5 0.8 ± 0.8 b 0.2 ± 0.2 b 1.0 0.6 ± 1.3 b 0 b 1.5 0.4 ± 0.5 b 0 b 2.0 0.2 ± 0.4 b 0 b Values ± standard errors are the average of six replicates. Values within a column followed by a common letter are not significantly different according to Tukey-Kramer test (P < 0.05). Percentage hatch of G. pallida eggs after 2 weeks exposure to five rates of B.juncea seed meal extract, followed by a greenhouse bioassay to assess reproduction of exposed cysts on potato.